Athlete-Mom Interview: Heather Gollnick | Move fast. Think slow. Describe your athletic background before and since having kids? When I first started in triathlon it was easy to schedule training and workouts because it was only my husband and I. I absolutely loved the sport and wanted to take it to the next level. Once I had young kids starting out with girl/boy twins I was so busy that I did not believe that I could do both and do both well, compete as a professional triathlete and be a great mom/wife. How would I possibly fit it all in? We lived in Wisconsin and after a few years of debating the move from age group to professional I made the jump when they announced Ironman Wisconsin would happen in the fall of 2002. I wanted to do that race as a Pro! After coming in as an unknown for the inaugural Ironman WI, and watching the press conference alone from the back, I went on to win the race after inspiration from my daughter Jordan. A few years later we had a third child and ever since it has been complete madness with my husband and I being out numbered. Training is not the number one thing but I can still get out there and mix it up and love it! What inspires you to keep competing? Many of the athletes I first started competing with such as Paula Newby Fraser, Heather Fuhr, and Lisa Bentley have all retired. I will be turning 43 and many ask how long I will still keep racing. I have always said when it is not fun any more or I don’t have that competitive drive I will stop. Well, I’m still going so I guess I still have both!! 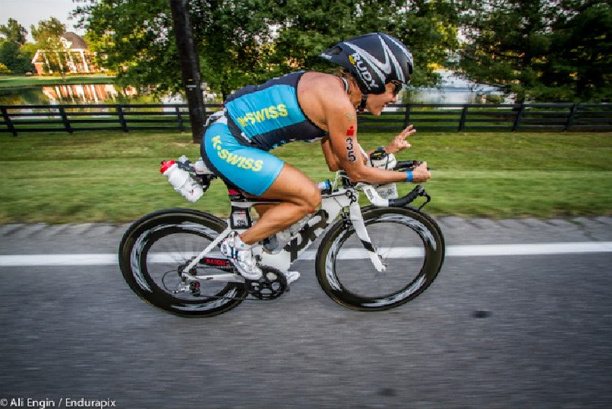 Natasha Badmann is my triathlon idol, she still rocks it at 45! How has your 2012 season gone so far? I had some early season injuries after my 3rd place in January at Ironman 70.3 Pucon in Chile and had to take some time off. Later in the season I did Ironman New York and a few weeks later was fourth at Ironman Louisville. Then I did my first ultra triathlon, The Leadman in Bend Oregon. Now I am enjoying some much-needed recovery and off-season and hope to start of 2013 with Pucon again. What is your advice to other moms? Be nice to yourself, we tend to be so hard on ourselves. If we miss a workout or are just too plain tired to do it we beat ourselves up. Every once in a while I like to treat myself to a hot bath or a mani with my daughter. Also remember training will always be there, your little ones get so big so fast. I can’t believe I have two teenagers and a seventh grader!!!! This year I cut down to just coaching and being a Visalus distributor as far as work and I am so happy to be home. And I have the flexibility to go to every xc meet, every cheer competition etc.